Eataly NY is a food hall or an upmarket food complex of Italian cuisine, where people can stop at the 12 restaurants and choose from the variety of Italian food on offer. The food here is all-Italian with each restaurant providing a completely different dining experience. It is known for its vast range of delightful food, ranging from true-blue pizza/ pasta Italian to vegetarian, a meat restaurant and a fish restaurant. There’s also a food market where you can buy rare ingredients, an espresso bar, wine store, cheese store, kitchenware shop, cooking school, etc. 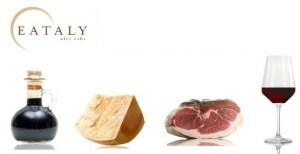 Eataly NY is just off Madison Square Park and covers 50,000 square feet of restaurants. It was started in Turin, Italy, in 2007 by Oscar Farinetti, who along with four partners, brought this novel idea to the United States. Location: 200 5th AVENUE, New York, NY 10010. Phone nr: +1 212 229 2560. Opening times: 11a.m.-10 p.m. (Monday-Saturday), 11 a. m.- 9:30 p. m. (Sunday). Price level (only one course): £20-£38 ($31-$60). Price level (2 courses & drink): (£24/$37.45). It is tasty because the pastas are fresh, and rich with different ingredients. Fresh mozzarella, salami, pizzas and juices. A few alternative cheap NY restaurants are Whitmans burgers and Lombardi’s thin pizzas.